Add inviting rustic style as well as functionality to your bedroom with the addition of this sleigh bed. This sleigh bed features two drawers on the footboard perfect for storing blankets and extra pillows. The classic sleigh shape with decorative molding and tasteful bun feet is covered in a rich mushroom finish that will easily match your existing decor. If you're looking for a stylish bed that doesn't sacrifice functionality, this sleigh bed is perfect for you. The 1026 Rustic Queen Sleigh Bed with Footboard Storage by United Furniture Industries at AHFA in the area. Product availability may vary. Contact us for the most current availability on this product. Capturing a unique balance of traditional style with a relaxed, rustic tone without sacrificing functionality, this bedroom collection will make a great addition to your home. Each piece is covered in a neutral mushroom finish that is rich and warm while the bun feet and rustic hardware add tasteful details that will brighten up any bedroom. 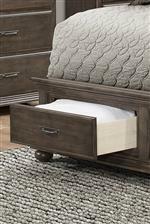 Offering a variety of storage pieces including footboard drawers, this group will quickly become a necessity in your home. 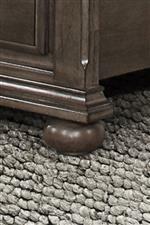 The 1026 collection is a great option if you are looking for Rustic Transitional furniture in the area.